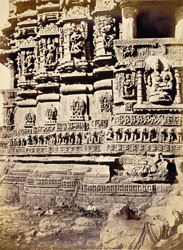 The Naulakha Temple is a large Hindu temple from the 13th Century much ruined but still preserving signs of its elaborate decoration. The temple is raised on a finely carved basement and consists of a sanctuary surrounded by a passageway and a mandapa of two storeys supported on elaborately carved columns. The tower over the sanctuary has collapsed.